The departement of the Alpes Maritimes - Pop. 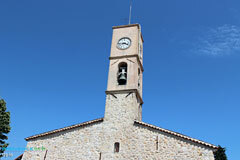 : 1.947 h.
and 16 km from Cannes. In a "protected" site, in the middle of a marvellous Mediterranean environment - olive trees, pines, cork oaks, arbutus trees, heather - stands the miniscule perched village of Opio. 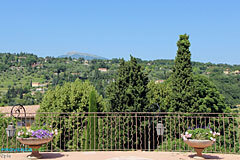 Thanks to an exceptional micro-climate, roses and jasmine are cultivated here for the Grasse perfume industry, while the Grande Bastide olive grove, one of the largest in the "departement", produces a delicious olive oil that you can buy at the Opio olive oil mill, one of the few such mills still operating in the region. It dates back to the 15th century. With a name derived from oppidum (fortified town in Latin), Opio has a long history. It was a seigneury of the bishop of Grasse until the Revolution. The village also has several remains from the Roman period, including a beautiful marble sculpture of a woman's head, currently on exhibition at the Grasse museum. Those who choose to spend their holidays here won't be disappointed by this peaceful setting, perfect for long walks or horse-riding in the midst of 450 hectares of forest. Golfers can combine business with pleasure: the Begude golf course premises are located in a former castle dating back to the 19th century, built on medieval foundations. St Trophisme church. (12th century, altered in the 15th century). 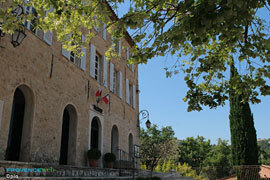 The 17th century residence of the Bishops of Grasse, with a beautiful stairwell. Oil mill (15th century). Oratories. Remains of the medieval monastery (Poudeirac quarter). Begude cave (150 m long), Mayol cave (125 m long). Hiking. Tennis. 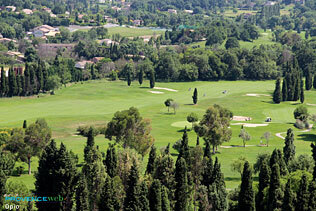 Opio-Valbonne 18-hole golf course. 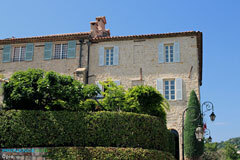 Chateauneuf in Grasse (3km), Le Rouret (3km), Roquefort les Pins (5km), Valbonne (5km).